To know more about the author and the genesis of the project. Hello Thierry. 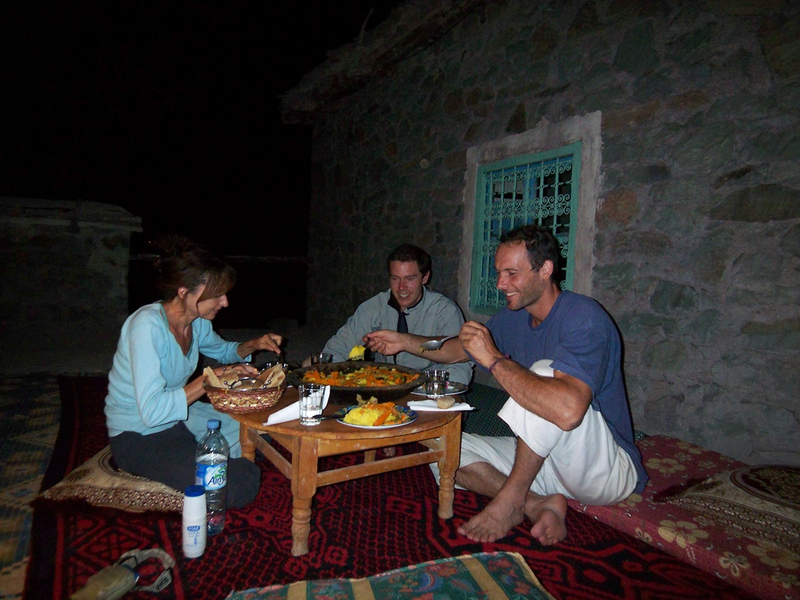 We know you well as author of the Corsica’s guidebooks but we don’t know more about you. Can you introduce yourself in a few words? I started climbing at the age of 15, but it became a passion only five years later. 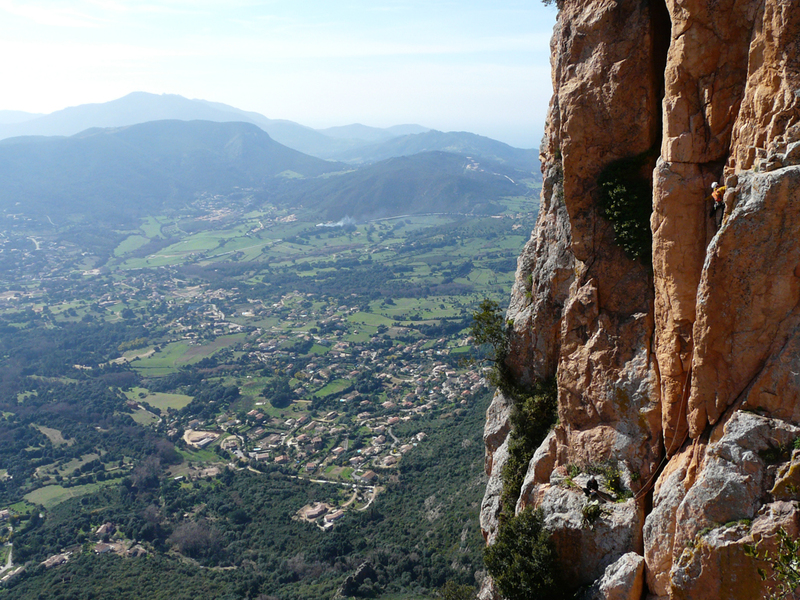 When I arrived in Corsica 20 years ago, I wanted to go beyond the stage of ‘consumer’ and invest myself in the development of the activity by re-equipping many sectors and multi-pitches routes around Ajaccio, Gozzi for those who know. 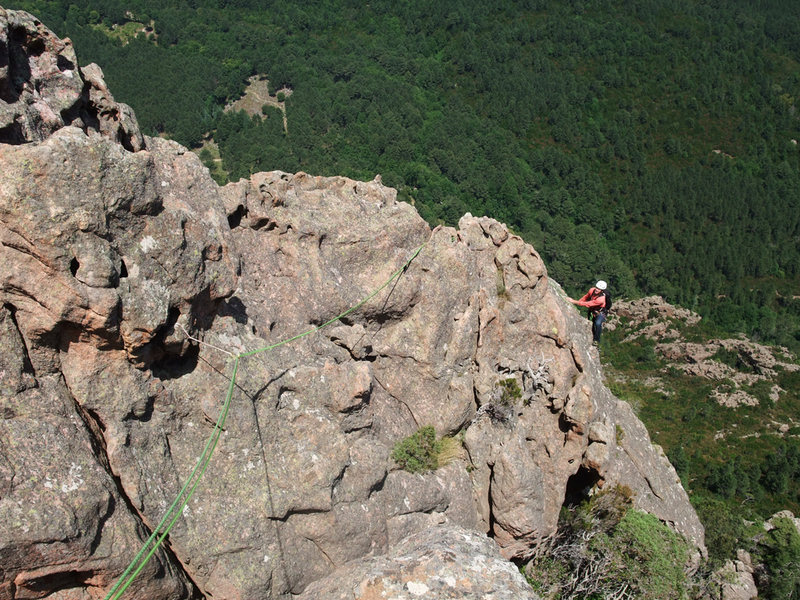 I also participated in some openings and especially the creation with friends of a climbing gym associative in Ajaccio to overcome the lack of infrastructure.Then with Bertrand Maurin, we began the realization of Falaises de Corse guidebook by associating the regional committee Corse FFME to generate revenues for the maintenance of the climbing areas. Finally, I also got the BE climbing. Corsica was not a playground big enough for you so you need to travel all around the globe? Since my arrival in Corsica, my personal practice is focused mainly on discovery and multipitches routes, preferably on stoppers/nuts. 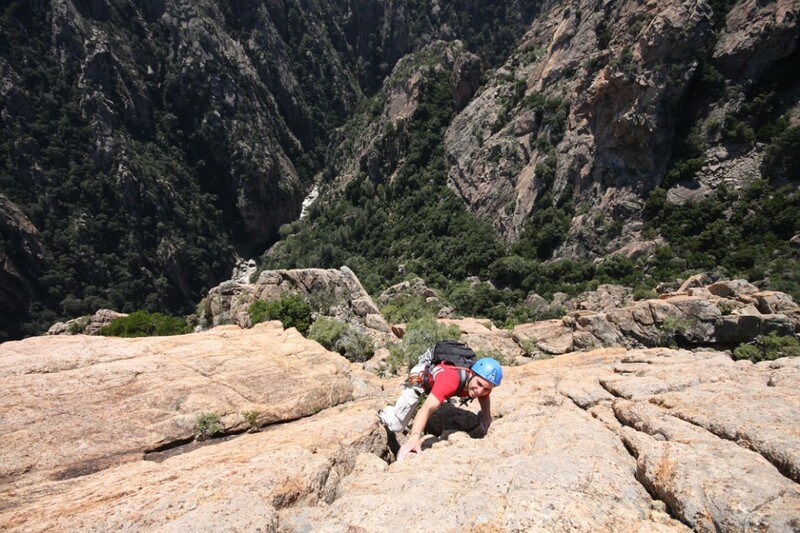 This has led me to make a guidebook of multi-pitches routes in Corsica. It was with the same motivation that I have climbed around the world in multi-pitches mainly, inspired and guided by the beautiful books of Arnaud Petit, the famous “Parois de légende” which have been my books for a long time. 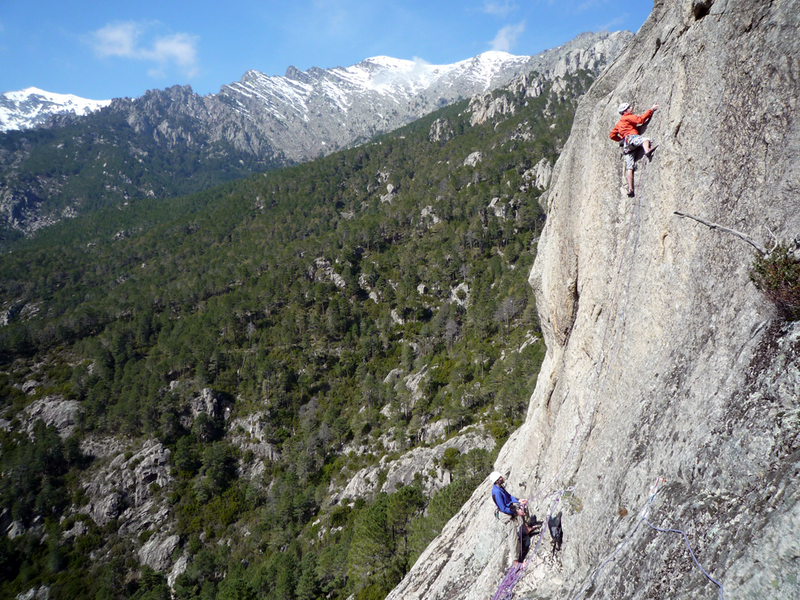 Corsica is a paradise of climbing still undervalued but it is obviously not the only one. 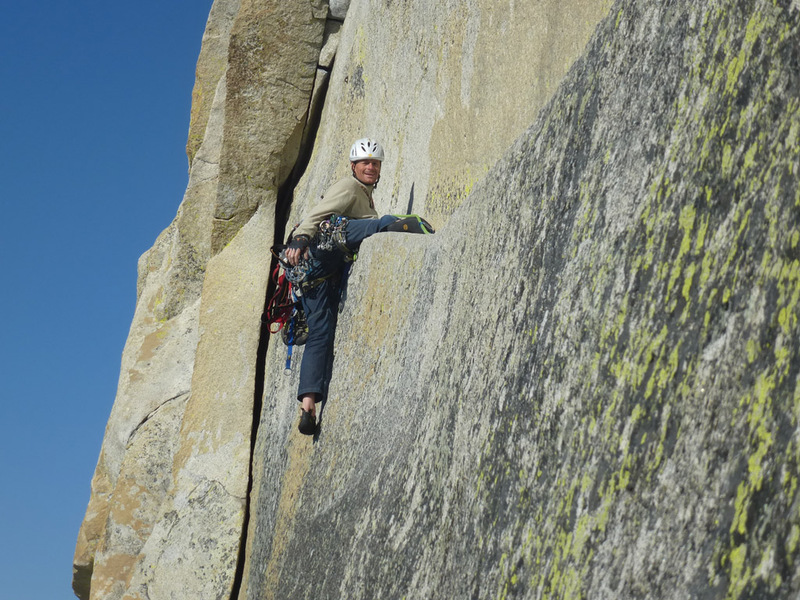 By going elsewhere, I discovered new cultures and often new styles of climbing. The world of climbing is small and rather intimate especially among practitioners of multipitches routes. 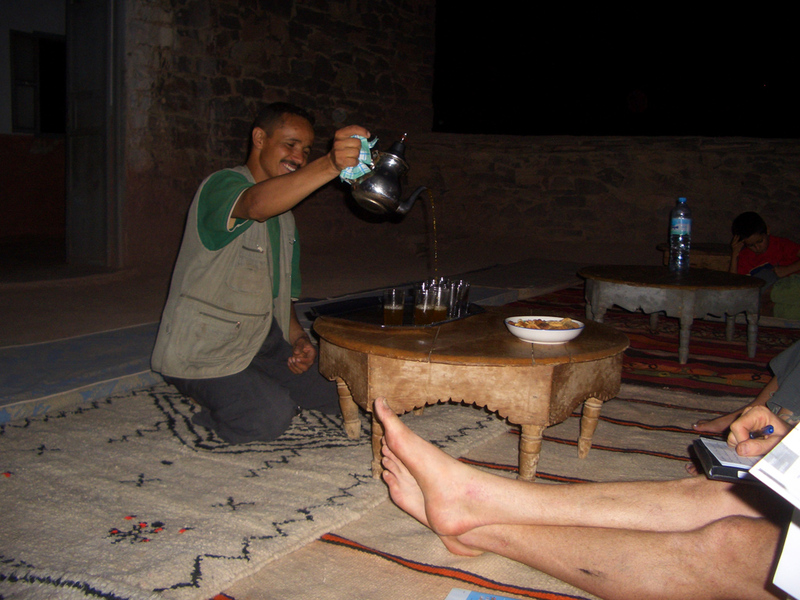 The contacts with the local climbers are done naturally and one can appreciate each country a little more of the interior; it is an opportunity to combine climbing with meeting and exchange. I stayed in touch with climbers from many countries. 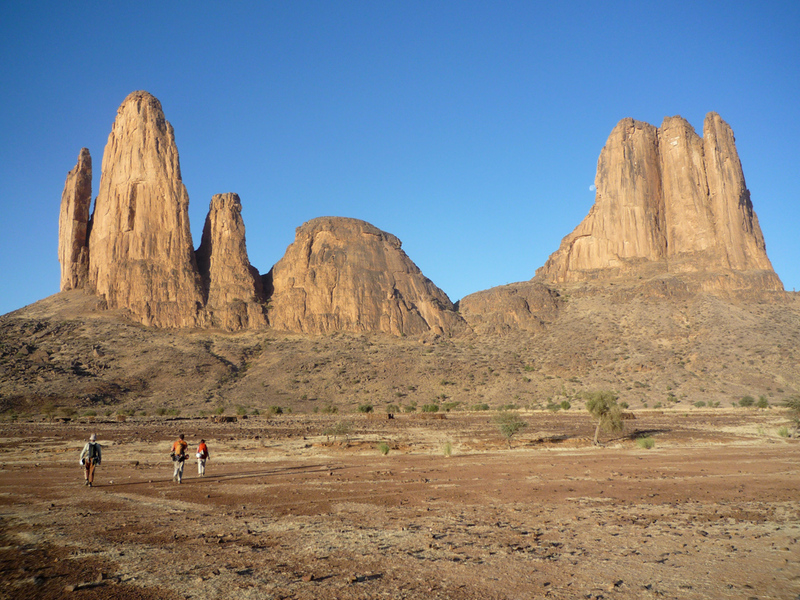 And then there are the landscapes of course that are often striking; I think for example of the sandstone walls of Wadi Rum or the pudding towers of Meteora, truly unique places. 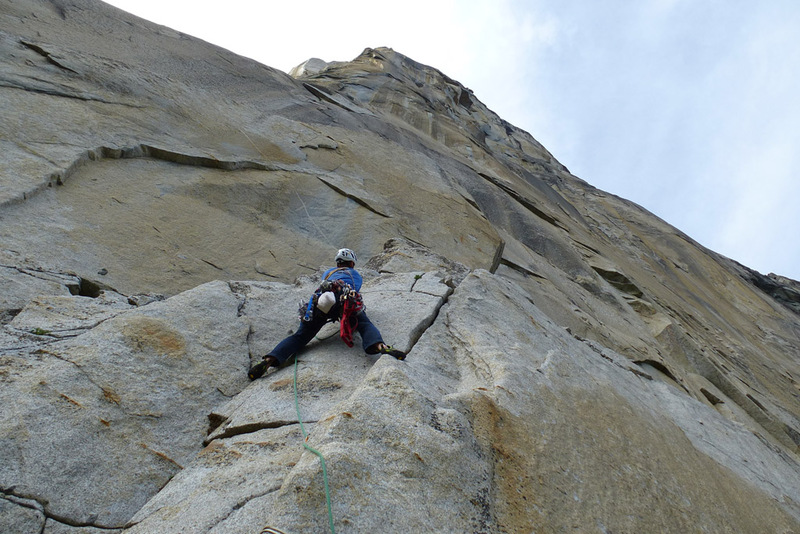 But we could mention others like the imposing wall of El Capitan Yosemite that I have already had the opportunity to climb twice or the hand of Fatma in Mali (a place to avoid now …). 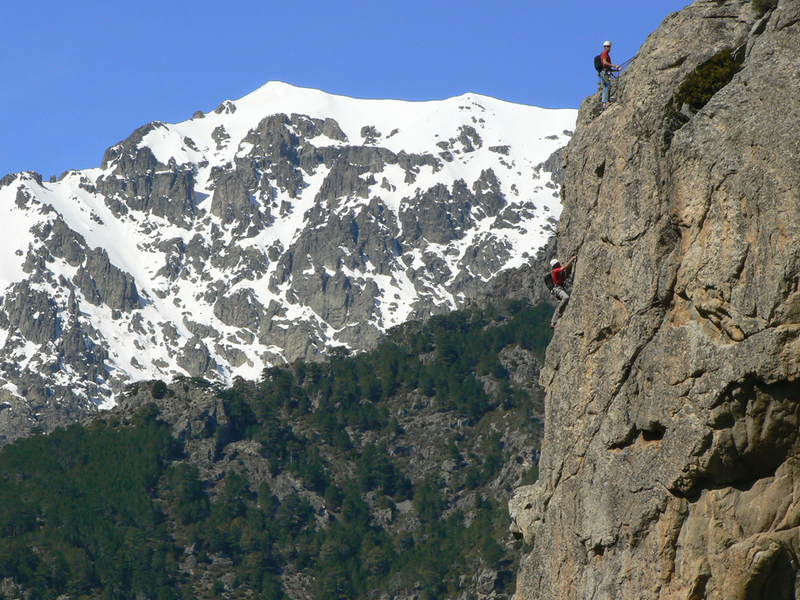 Climbing is a pretext for discovery and travel … unless it’s the opposite. 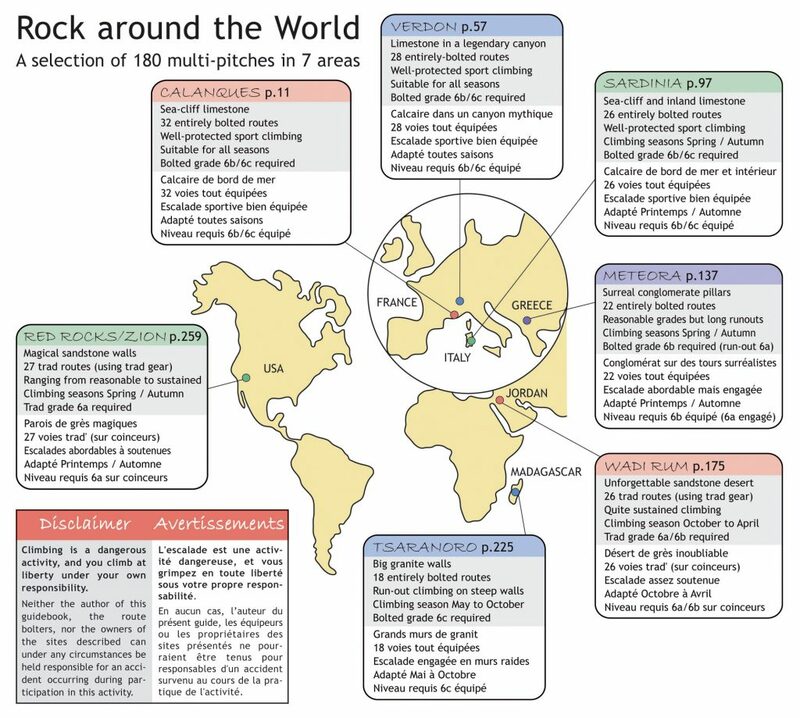 The multipitches routes around the world: how can you embrace such a project? It was almost a logical follow-up after the release of the Corsica guidebook Grandes voies de Corse in 2012 and all the trips I had already done. I started with the same desire to make a ‘utility’ guidebook, meaning precise in the informations and sufficient for a first trip to each destination, but also with beautiful full-page climbing pictures to dream before leaving . From then on, I took great care to return to the chosen destinations and sometimes even to redo routes that had already been climbed when I thought it necessary. How long did it take you and how many areas are described? How did you choose the selected destinations? 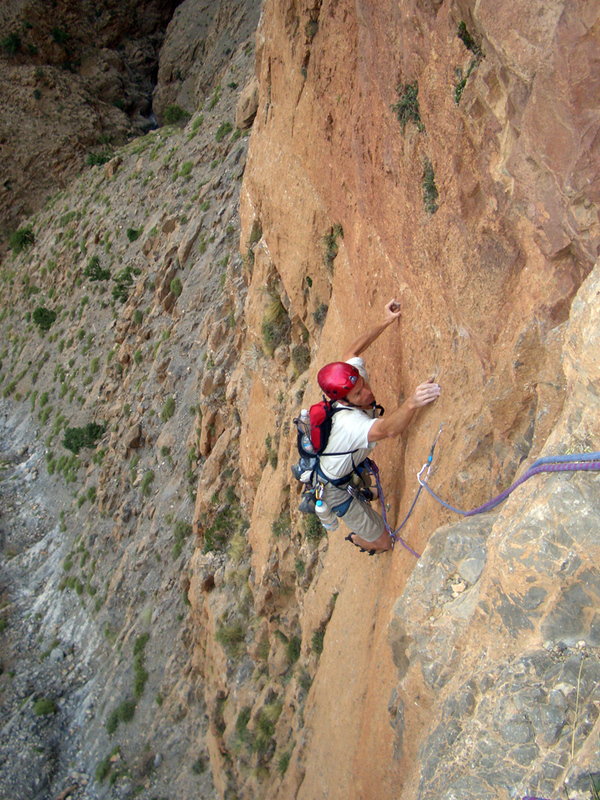 The ‘climbing’ interest was the main criterion for the choice of sites. But accessibility from Europe, a fairly stable weather over favorable times and the absence of unacceptable political tensions were also indispensable conditions. 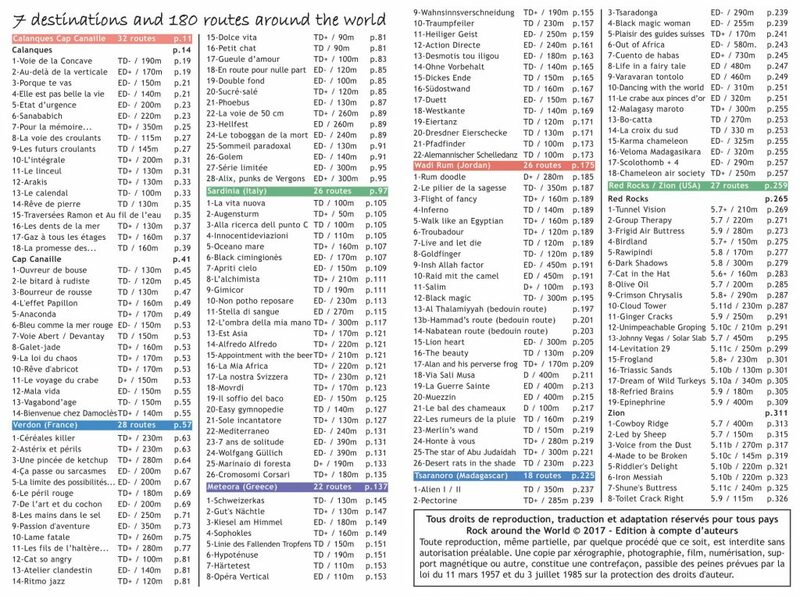 The mandatory level required for the routes shown ranges from 6a to 6c for bolted routes and from 5c to 6b for trad routes. There is a digital version of the Meteors already available on the ClimbingAway app. Have you planned to put more online? Yes, I planned to put all destinations online by the end of the year. Can you tell us more about the book? It is in several languages? How many pages, format, price and how to get it? This is a classic format book “guide” 15X21, 328 pages any color, public price 35 euros. 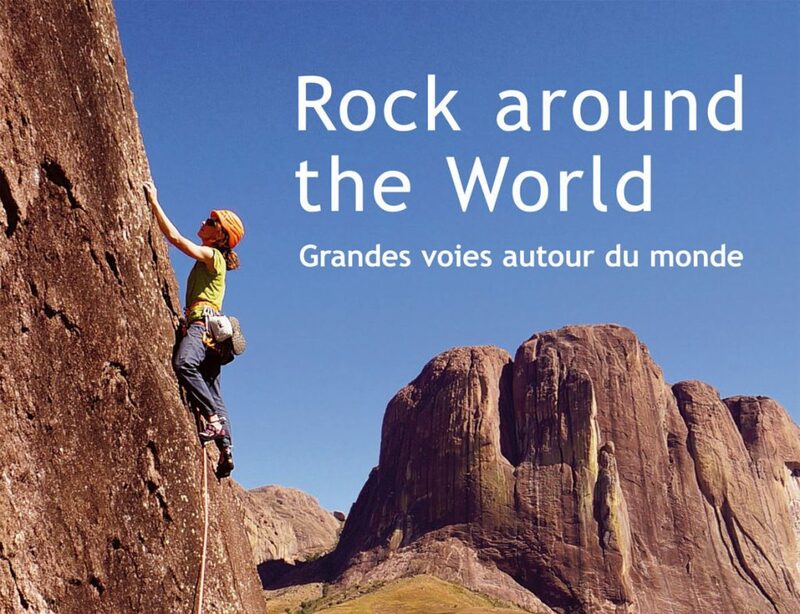 I chose a title in English, Rock around the World, because I hope to broadcast at least as much abroad as in France. It is fully bilingual French / English and will be distributed throughout Europe from early December. This topo is a topo of multi-pitches routes. Do you have any advice for gym climbers or single pitch climbers who would like to try multi? 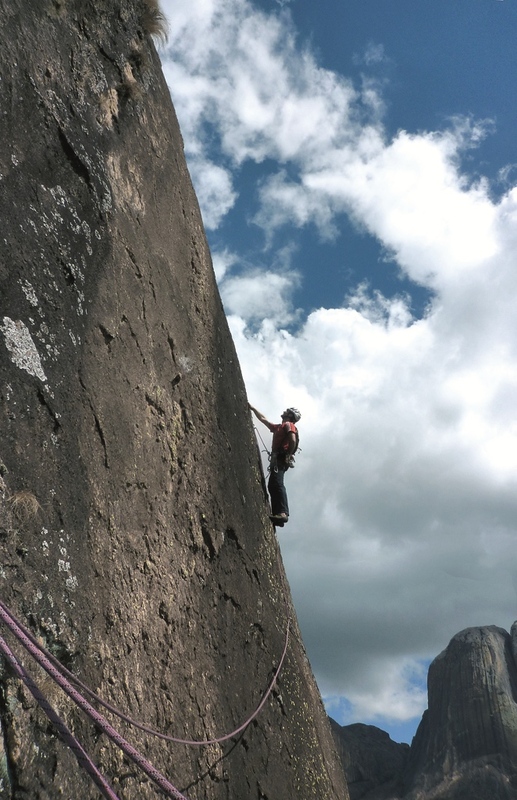 Whatever the practice, climbing is an activity that can be potentially dangerous if you do not do it properly. 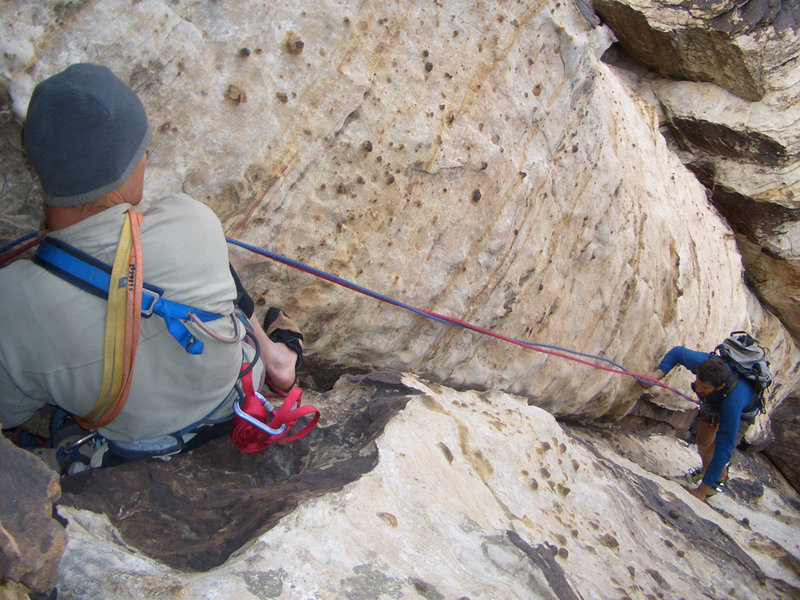 It seems to me essential to start with people who will be able to explain the right actions, whether in an club or by calling in a professional directly; it also involves observation and curiosity, for example by going through his first multi pitches route top rope (with a reliable leader of course). And of course, do not skip the steps, especially to go to the adventure field where you really have to stay modest during his first experiences: the pleasure is not necessarily here in the difficulty and pure sports performance but in the discovery and the much stronger adventure that emerges. And you? What is your preferred climbing area? Corsica obviously! It is a huge playground whose potential seems inexhaustible but I risk being taxed chauvinism. 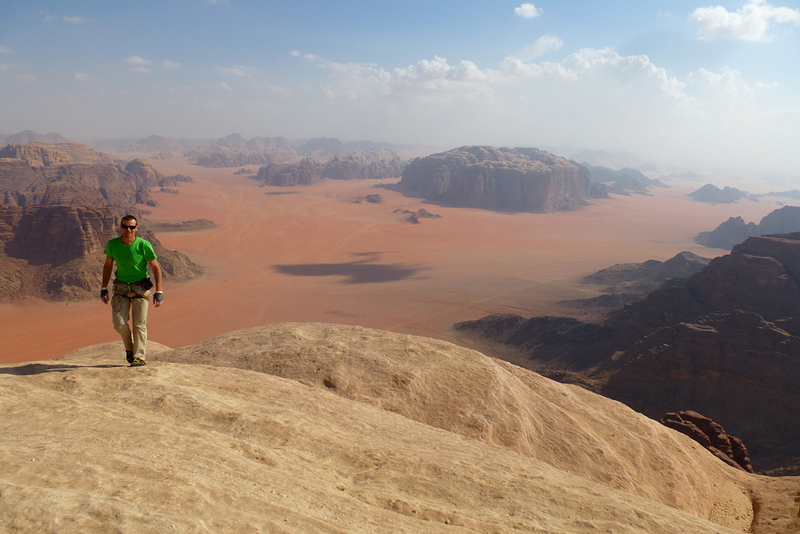 Abroad, Meteora and Wadi Rum are the two destinations that have marked me the most; I think that any climber of big ways must have visited these 2 sites at least once in his life! Strangely these are not the destinations where climbing is the most beautiful intrinsically (be careful, it’s still great climbing) but there is a supplement … Come on, let’s say, spiritual almost palpable. 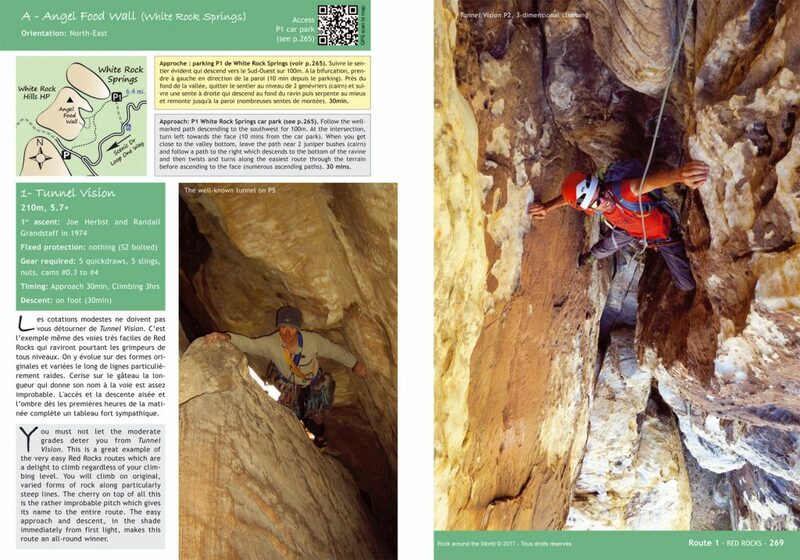 Finally, can you tell us about the news of the guidebook “Falaises de Corse”? I just put the final point to ‘Rock around the world’ and I’m currently working on the new edition of “Falaises de Corse”. It should be released in March / April 2018. 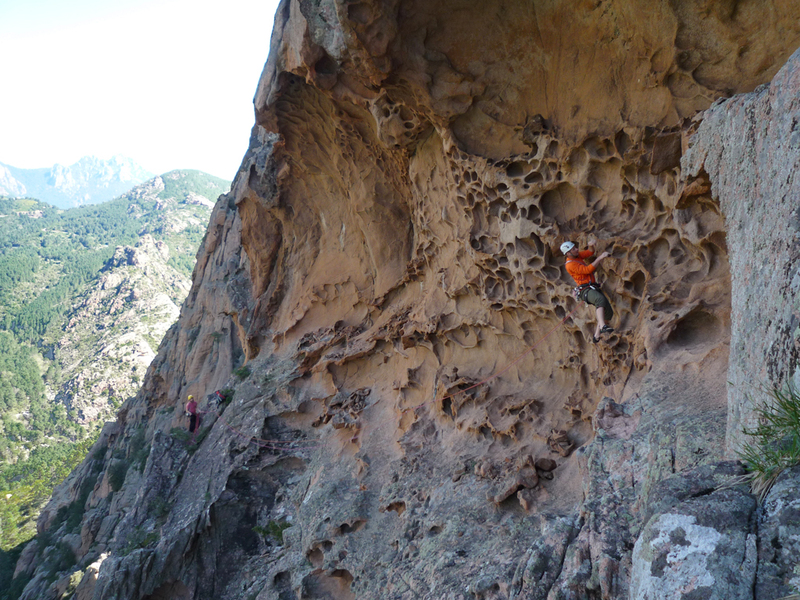 There will be something new, especially in the South of Corsica with superb cliffs turned to the high level (until 9a and up!) And the confirmation of a trend, certainly still a little marginal: the single pitches in trad ‘especially on Bavella: absolutely major! The partnership with ClimbingAway will continue in 2018: having already published 3 regions of Corsica in digital format, we should continue broadcasting by next spring with all the cliffs of Corsica updates available on the app. This climbing guidebook is a collection of some major destinations around the world, presenting for each one a selection of multi-pitch climbs which are more than enough to fill a first trip. Some may find that just 7 regions is too few. 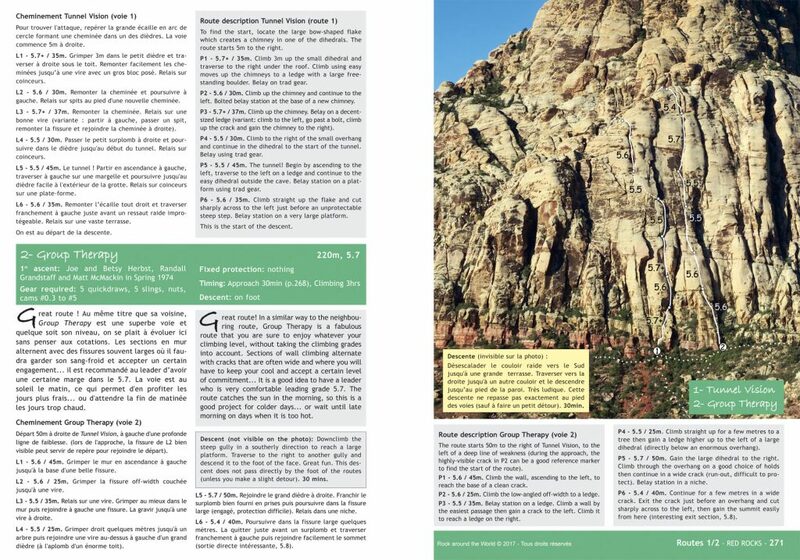 Don’t be frustrated by this; instead, look at this guidebook as a good guide for a first trip, also giving you the opportunity in the future to go on to do 6 more! Ce topo d’escalade regroupe quelques destinations majeures autour du monde en présentant pour chacune une sélection de grandes voies largement suffisante pour remplir un premier séjour. Certains pourront regretter de ne trouver que 7 régions. N’en soyez pas frustrés et au contraire, voyez ce topo comme un bon guide pour un premier voyage avec pour horizon la possibilité d’en enchaîner 6 autres ! Pour en savoir plus sur l’auteur et la genèse du projet. Bonjour Thierry. On te connait bien comme auteur du topo des falaises de Corse mais on n’en sait pas plus sur toi. Peux-tu te présenter en quelques mots ? J’ai commencé la grimpe vers 15 ans, mais ce n’est devenu une passion que 5 ans plus tard. A mon arrivée en Corse il y a 20 ans, j’ai voulu dépasser le stade de ‘consommateur’ et m’investir dans le développement de l’activité en rééquipant de nombreux secteurs et grandes voies autour d’Ajaccio, au Gozzi pour ceux qui connaissent. J’ai aussi participé à quelques ouvertures et surtout à la création avec des potes d’une salle d’escalade associative à Ajaccio pour palier à l’absence d’infrastructure. Puis avec Bertrand Maurin, on s’est lancé à compte d’auteur dans la réalisation du topo Falaises de Corse en associant le comité régional Corse FFME pour générer des retombées servant à l’entretien des sites. Enfin, j’ai aussi passé le BE escalade. La Corse n’était pas un terrain de jeu assez grand pour que tu crapahutes de la sorte tout autour du globe ? Depuis mon arrivée en Corse, ma pratique personnelle est axée principalement sur la découverte et les grandes voies, de préférence sur coinceurs. Cela m’a d’ailleurs conduit à réaliser un topo de grandes voies en Corse. C’est avec la même motivation que j’ai été grimper un peu partout autour du monde en grandes voies principalement, inspiré et guidé par les beaux livres d’Arnaud Petit, les fameux “Parois de légende” qui ont été longtemps mes livres de chevet. La Corse est un paradis de l’escalade encore sous-évalué mais ce n’est évidemment pas le seul. En allant voir ailleurs, j’ai pu découvrir de nouvelles cultures et souvent de nouveaux styles de grimpe. Le monde de l’escalade est petit et plutôt intimiste surtout chez les pratiquants de grandes voies. Les contacts avec les grimpeurs locaux se font naturellement et on peut apprécier chaque pays un peu plus de l’intérieur ; c’est l’occasion d’allier la grimpe à la rencontre et l’échange. Je suis d’ailleurs resté en contact avec des grimpeurs de bien des pays. Et puis il y a les paysages bien sûr qui sont souvent marquants ; je pense par exemple aux parois de grès du Wadi Rum ou encore aux tours de poudingue des Météores, des lieux vraiment uniques. 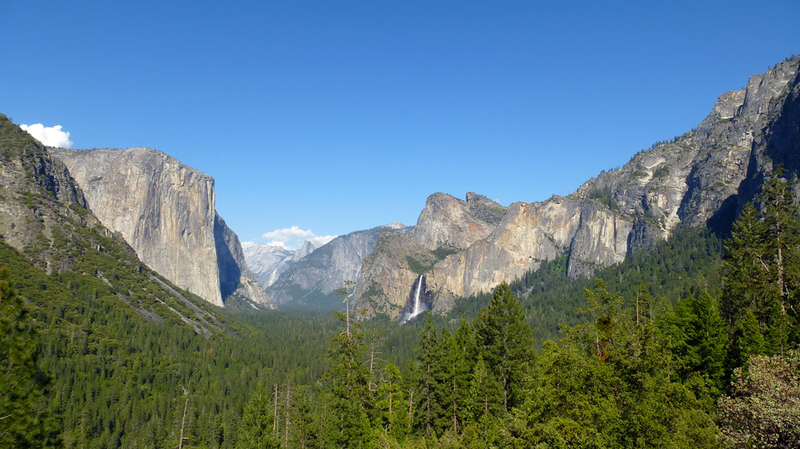 Mais on pourrait en citer d’autres comme l’imposante paroi d’El Capitan au Yosemite que j’ai déjà eu l’occasion de gravir à 2 reprises ou encore la main de Fatma au Mali (un endroit désormais à éviter…). L’escalade est un prétexte à la découverte et au voyage… à moins que ce ne soit le contraire. Les grandes voies autour du monde : qu’est ce qui t’a poussé à te lancer dans un projet d’une telle envergure ?! C’était presque une suite logique après la sortie du topo Grandes voies de Corse en 2012 et tous les voyages que j’avais déjà fait. Je me suis lancé avec la même envie de faire un topo ‘utilitaire’, c’est à dire précis dans les informations et suffisant pour un premier voyage vers chacune des destinations proposées, mais avec aussi de belles photos de grimpe pleine page pour faire rêver avant de partir. Dès lors, j’ai pris un grand soin à retourner sur les destinations choisies et parfois même à refaire des voies déjà gravies quand je l’estimais nécessaire. Combien de temps ça t’as pris et combien de sites sont décrits ? Qu’est ce qui t’as guidé vers les destinations retenues ? L’intérêt ‘escalade’ a été le principal critère pour le choix des sites. Mais l’accessibilité depuis l’Europe, une météo assez stable sur les périodes propices et l’absence de tensions politiques rédhibitoires étaient aussi des conditions indispensables. Le niveau obligatoire requis pour les voies présentées s’échelonne de 6a à 6c pour les voies équipées et de 5c à 6b pour les voies sur coinceurs. Il y a une version numérique des Météores déjà disponible sur l’application Climbing Away. As-tu prévu d’en mettre d’autres en ligne ? Oui, j’ai prévu de mettre toutes les destinations en ligne d’ici la fin de l’année. Peux-tu nous en dire plus sur le bouquin ? Il est en plusieurs langues ? Combien de pages, format, prix et comment surtout se le procurer ? C’est un livre au format classique “topo” 15X21, 328 pages tout couleur, prix public 35 euros. J’ai choisi un titre en anglais, Rock around the World, parce que j’espère le diffuser au moins autant à l’étranger qu’en France : Il est entièrement bilingue français / anglais et sera distribué un peu partout en Europe à partir de début décembre 2017. Ce topo est un topo de grandes voies. As-tu des conseils à donner aux grimpeurs de salle ou de falaise qui souhaiteraient se lancer dans la grande voie ? Quelle que soit la pratique, l’escalade est une activité qui peut être potentiellement dangereuse si on ne s’y prend pas correctement. Il me semble indispensable de commencer avec des gens qui seront capables de vous expliquer les bons gestes, que ce soit dans un cadre associatif ou en faisant appel à un professionnel directement ; cela passe aussi par l’observation et la curiosité, par exemple en parcourant ses premières grandes voies en second (avec un leader de cordée digne de confiance évidemment). Et bien sûr, il ne faut pas griller les étapes, notamment pour passer au terrain d’aventures où il faut vraiment rester modeste lors de ses premières expériences : le plaisir n’est plus forcément ici dans la difficulté et la pure performance sportive mais dans la découverte et l’aventure bien plus forte qui en ressort. Et toi ? C’est lequel ton site de grandes voies favori ? La Corse évidemment ! C’est un immense terrain de jeu dont le potentiel semble inépuisable mais on risque de me taxer de chauvinisme. A l’étranger, les Météores et le Wadi Rum sont les deux destinations qui m’ont le plus marquées ; je pense que tout grimpeur de grandes voies se doit d’avoir visité ces 2 sites au moins une fois dans sa vie ! Bizarrement ce ne sont pas les destinations où l’escalade est la plus belle intrinsèquement (attention, c’est tout de même de l’escalade superbe) mais il y a un supplément… allez, disons-le, spirituel quasi palpable. Pour finir, peux-tu nous parler de l’actualité du topo des falaises de Corse ? Je viens de mettre le point final au ‘topo monde’ et je bosse actuellement sur la nouvelle édition du topo Falaises de Corse. Elle devrait sortir en mars/avril 2018. 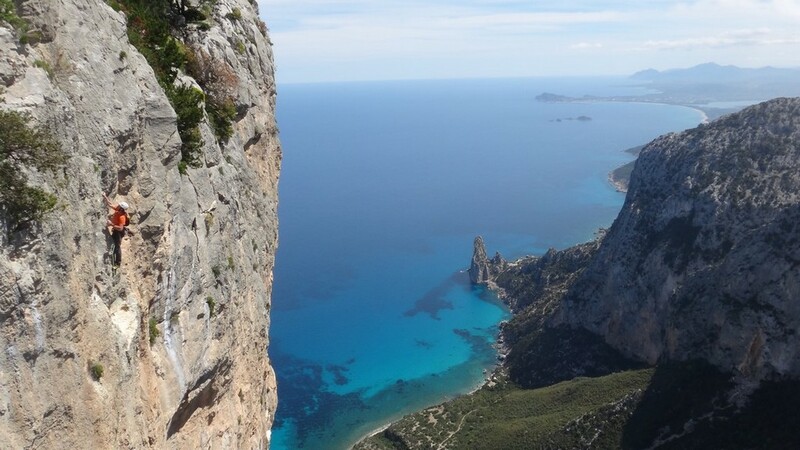 Il y aura du nouveau, surtout dans le Sud de la Corse avec des falaises superbes tournées vers le haut niveau (jusqu’au 9a et plus !) et la confirmation d’une tendance, certes encore un peu marginale : les couennes en trad’ notamment sur Bavella : absolument majeur ! Le partenariat avec Climbing Away va se poursuivre en 2018 : après avoir déjà publié 3 régions de Corse en format numérique, on devrait poursuivre la diffusion d’ici le printemps prochain avec la totalité des falaises de Corse mises à jour disponibles sur l’appli. 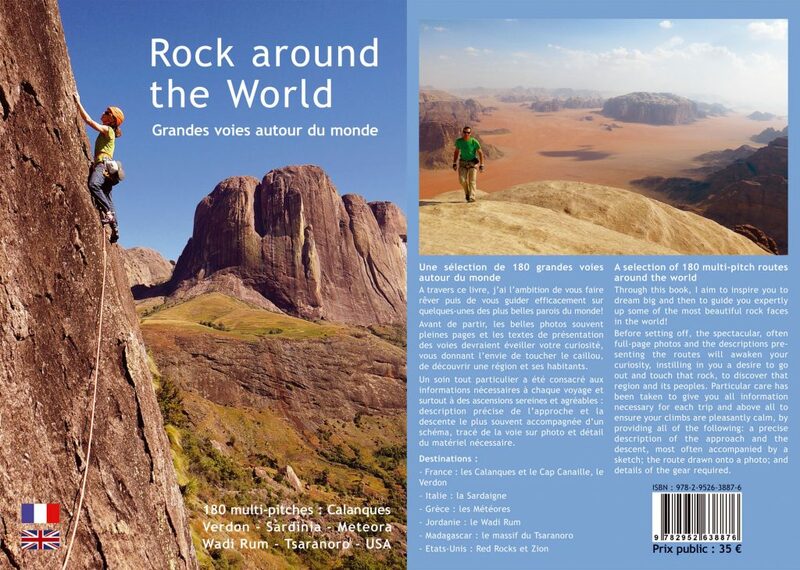 328 pages tout couleur, qui détaillent 180 grandes voies sur 7 destinations autour du Monde ! Situé à quelques minutes de route de Las Vegas, le parc national de Red Rock est le lieu idéal pour découvrir l’escalade sur le continent américain sans être trop dérouté. Ici, pas besoin d’être un as du « verrou » en fissure pour se faire plaisir. L’escalade se fait sur coinceurs mais le rocher, un grès très sculpté aux couleurs chaudes, offre des préhensions très variées. On trouve des grandes voies superbes et originales dans des niveaux très accessibles (à partir de 5.5 soit 4+ en cotation française). Pour les plus aguerris, il est aussi possible d’aller découvrir les grandes parois de Zion à moins de 3h de route. Autre intérêt de cette destination, la proximité d’un aéroport international et la possibilité de coupler ce voyage escalade avec la visite de nombreux parcs nationaux (Bryce canyon, Canyonland, Arches NP…). C’est un petit désert dont vous ne ressortirez pas indemne ! La beauté des paysages se conjugue avec une escalade fantastique sur des montagnes de grès… une destination incontournable dans la vie d’un grimpeur. L’escalade se fait ici entièrement sur coinceurs et vous apprécierez d’autant plus de pouvoir être guidé. On y trouve aussi de superbes « randos bédouines », sortes de déambulations verticales qui permettent de rejoindre les sommets environnants « au plus simple » mais où il est souvent nécessaire d’être encordés. Idéalement, il faudra prévoir une journée supplémentaire pour découvrir la cité nabatéenne de Petra, un lieu chargé d’histoire dont la visite s’impose lors d’un premier séjour en Jordanie. C’est un voyage à 2 pas de chez vous, accessible rapidement et pourtant déjà bien dépaysant, on est en Italie avec son accent chantant. A l’inverse de la Corse granitique, on trouve ici essentiellement des massifs calcaires, que ce soit en bord de mer ou dans l’intérieur, en falaises et en grandes voies de plusieurs longueurs. Entre Cala Gonone et Baunei sur la côte Est, il est possible de varier les plaisirs sans faire trop de route. C’est le massif d’escalade le plus connu en Corse, à juste titre, vu la densité et la qualité des voies. Le choix est donc très vaste et il s’agit ici de quelques idées, parmi les plus classiques. Tout proche de Porto, la face Est du Capu d’Ortu en impose et offre des itinéraires en terrain d’aventure de toute beauté. L’envergure de cette paroi la réserve aux grimpeurs endurants qui sont prêt à passer une longue journée sans faiblir. C’est LA vallée emblématique du cortenais, point de départ de belles balades vers la haute montagne insulaire. La punta Spenicazzia propose 2 belles classiques de style et difficulté variées sur un rocher exceptionnel. L’autre vallée du cortenais, tout aussi belle mais plus sauvage et préservée. Une jolie marche sur un ancien sentier muletier vous permettra d’apprécier la quiétude du lieu avant de grimper sur le rocher du Rossolino dans un dièdre majeur. C’est un peu mon « jardin » et il recèle plusieurs voies superbes sur un granit coloré qui ne vous laissera pas indifférent, avec en prime une vue imprenable sur tout le golfe d’Ajaccio. Il est possible de grimper toute l’année en Corse, en s’adaptant au climat pour en profiter pleinement. Entre parois de bord de mer et montagnes de l’intérieur, voies équipées ou itinéraires en terrain d’aventure, vous trouverez forcément votre bonheur. L’engagement se fait à la demi-journée ou la journée, pour 2 personnes maximum. Tarif à partager entre les participants de 150 à 200 € pour une demi-journée, 250 à 400 € pour la journée complète, variable en fonction de la longueur et de la difficulté de la voie. Mais n’hésitez pas à demander, je peux vous proposer plein d’autres voies dans ces massifs ou dans d’autres visibles sur la carte ci-contre. Autodidacte dans ce domaine, j’ai acquis tout le savoir faire et une certaine expérience dans l’utilisation des différents logiciels de mises en page et de traitement de photos lors de la conception des topos d’escalade sur la Corse. Dès lors, je vous propose mes services, à travers des prestations d’infographie voire même comme éditeur si le projet me séduit. Vous avez une idée de topo ? Contactez moi pour étudier ensemble ce projet. Le succès de mes topos sur la Corse m’a donné envie d’aller plus loin… et pourquoi pas un topo d’escalade autour du monde ? Personnellement, j’ai été guidé par les beaux livres d’Arnaud Petit, « Parois de légende » (autour du Monde et en Europe). Si ces livres m’ont fait rêver et donné des idées de voyage, ils n’étaient pas suffisants pour aller grimper sur chaque site, ne présentant qu’une sélection très réduite de voies à chaque fois. Mon concept est différent, il s’agit de présenter quelques destinations à travers le monde, en décrivant suffisamment de voies pour pouvoir grimper durant un séjour sans avoir besoin d’investir dans un autre topo. Le choix des destinations s’est fait en s’appuyant sur mes voyages déjà réalisés, et en respectant 3 critères importants : accessible facilement depuis l’Europe, sans tension politique majeure et avec une météo relativement clémente. Le projet de topo « Grandes voies autour du Monde », débutté fin 2013, a été retardé suite à un accident de moto… Mais il a été relancé à temps plein en 2017 et sort enfin le 1er décembre sous le titre Rock around the World. Avec mon collègue Bertrand Maurin, j’ai réalisé 2 topos d’escalade sur la Corse qui restent aujourd’hui des références. Ces 2 topos sont conçus de la même manière, en mettant en avant de belles photos d’escalade pour faire rêver, mais aussi en portant un soin tout particulier à la précision des informations données. La Corse étant une région touristique très prisée, ces 2 topos sont entièrement bilingues français / anglais pour être accessibles à tous. L’escalade est aussi un prétexte aux voyages et aux rencontres, la découverte du monde, l’occasion d’être confronté à d’autres cultures et modes de vie, ou simplement à des paysages grandioses. Le programme précis sera défini ensemble en fonction de votre niveau et de vos envies. J’indique un ordre de grandeur de prix tout compris actualisé à 2014 qui sera à affiner, principalement en fonction des coûts de transport aérien. Contactez-moi pour définir ensemble le séjour qui pourra vous convenir parfaitement. La Corse recèle tant de trésors cachés qu’il faudrait une vie entière pour les découvrir. L’idéal pour apprécier les lieux consiste à se poser quelques jours dans un site et grimper quelques voies « en étoile », en allant visiter les vallées environnantes. Je peux vous proposer 2 destinations, à adapter en fonction des saisons et de la météo du moment : Bavella et Corte. Tarif variable en fonction de la qualité de l’hébergement souhaité (250 €/j pour les frais d’encadrement + mes frais d’hébergement à partager entre les participants). Rien de tel qu’un stage de quelques jours pour vous accompagner vers l’autonomie. Le massif de Bavella est le lieu idéal, parce qu’il offre un énorme choix d’itinéraires de tous niveaux, des falaises « école » et des grandes voies adaptées, en plus de possibilités d’hébergement à proximité. Il est possible de grimper toute l’année en Corse, en s’adaptant au climat pour en profiter pleinement. Entre parois de bord de mer et montagnes de l’intérieur, voies équipées ou itinéraires en terrain d’aventure, vous trouverez forcément votre bonheur. Voilà quelques idées dans différents massifs, mais n’hésitez pas à demander, je peux vous proposer plein d’autres voies. C’est un peu mon « jardin » et il recèle plusieurs voies superbes sur un granit coloré qui ne vous laissera pas indifférent, avec un prime une vue imprenable sur tout le golfe d’Ajaccio. A 2 pas de Porto, la face Est en impose et offre des itinéraires en terrain d’aventure de toute beauté. Une grande voie, c’est une voie de plusieurs longueurs où il est nécessaire d’installer un relais et faire monter le second de cordée avant de poursuivre dans la longueur suivante. Une grande voie, c’est tout de suite un petit voyage, une petite aventure qui marque ! N’ayez crainte, on trouve des grandes voies de tous niveaux, et il y aura forcément un itinéraire adapté à vos capacités et votre envie. A travers ces pages, vous trouverez quelques idées de voies où je peux vous guider, mais n’hésitez pas à demander, les possibilités sont très nombreuses et je peux vous proposer d’autres idées qui sortent des sentiers battus, en Corse, dans le Sud de la France ou en voyage plus ou moins lointain. Le Brevet d’Etat Escalade me permet d’encadrer en escalade et en canyon… n’hésitez pas à me solliciter pour une sortie en canyon ou en falaise (école d’escalade) – pour les groupes constitués à partir de 4 personnes. Je peux tout simplement vous guider mais aussi vous former aux différentes formes de pratique pour vous accompagner vers l’autonomie. En naviguant sur ce site, vous comprendrez surement que mon attirance va en priorité vers les grandes voies ; à titre personnel, je continue à répéter et ouvrir des voies en Corse, et c’est aussi un prétexte aux voyages et à la découverte du monde. Et donc, j’apprécierai tout particulièrement de vous emmener sur des itinéraires de plusieurs longueurs, en Corse ou ailleurs, pour vous faire découvrir l’ambiance de cette pratique, prendre de la hauteur et atteindre des sommets où jouir d’une vue différente sur un massif. Cela peut être l’occasion de découvrir des itinéraires en second de cordée, mais je peux aussi vous guider et vous accompagner vers l’autonomie, en grande voie équipée ou même en « terrain d’aventure ». Dernière corde à mon arc, je continue à concevoir et éditer des topos d’escalade (voir la rubrique Topographie / Escalades en Corse et Grandes voies autour du Monde). Outre mes propres projets de topos, je peux proposer mes services en infographie pour ceux que ça intéresse (voir la rubrique Topographie / Infographie). J’ai 43 ans, et je grimpe depuis 25 ans, par passion surtout bien avant d’en faire mon métier. Ma « première vie professionnelle » a été consacrée aux énergies renouvelables, d’abord à Montpellier puis pendant plus de 15 ans en Corse. En arrivant sur cette « montagne dans la mer », ma passion de l’escalade s’est enrichie de nouvelles rencontres et de nouvelles pratiques. Rapidement, j’ai été très actif et j’ai acquis certains savoir-faire au sein d’une association locale, le Corsica Roc : entretien de sites naturels et rééquipement de voies, ouverture de nouveaux secteurs, réalisation d’un topo, trésorier, création d’une salle d’escalade… Cet engagement bénévole s’est fait naturellement en même temps que je découvrais les différents massifs insulaires, avec une préférence toute particulière pour les grandes voies aventureuses non équipées qui ont fait l’histoire de la Corse verticale. L’île est petite et tous les grimpeurs locaux se connaissent. En 2005, suite à une prise de conscience collective face à un vide flagrant, je me lance avec mon ami Bertrand dans la conception et l’édition d’un topo sur toutes les falaises de Corse, en associant le Comité FFME à l’aventure ; c’est le début d’un travail d’auteur éditeur, l’apprentissage de nouveaux outils informatiques et des prises de vue et un tour de Corse pendant un an pour arriver à nos fins… la première édition du topo « Falaises de Corse » sort en juin 2006. C’est tout de suite un véritable succès qui nous oblige à rééditer ce topo tous les 2 ans en le complétant et l’améliorant : déjà la 5e édition en 2015 ! Evidemment, toutes ces expériences m’ont donné envie d’aller plus loin, et de passer le diplôme de brevet d’état Escalade, obtenu en mai 2010. Mes débuts comme moniteur seront surtout aquatiques, avec des saisons d’été à travailler en canyon. Avec Bertrand, l’aventure « topos » se poursuit par un autre projet très motivant, proposer une sélection de grandes voies, et donc, « l’obligation » de grimper ces voies !… « Grandes voies de Corse » arrivera comme un cadeau de noël en décembre 2011 (puis une 2e édition très enrichies en février 2015). Enfin en 2013, le pas est franchi : je délaisse définitivement le bureau et les énergies renouvelables pour me consacrer entièrement à mes activités de moniteur d’escalade et d’édition de topos… Place à de nouvelles aventures, à partager avec des clients et avec un nouveau projet de topo Grandes voies autour du monde.